Ceder City Half Marathon Contest! Here at PcTrailRunner we have been given a free entry to give away to the 2012 Cedar City Half Marathon on September 15. But we are not going to just give it away we are going to have a contest, which will make this a whole lot of fun! Okay here is the question for the contest, the first person to guess it right receives a free entry to the Ceder City Half Marathon, a running visor, and a PcTrailRunner sticker. What is the name of this Mountain Range? What is the tallest peak? This contest will close on 5/15/12 so make sure to tell your friends and most importantly have fun!! Please comment your answer below. Stay updated on everything you need to know about trails! Grand Teton National Park, Teton Range, Grand Teton…. pwstoughton wins! !Please send me your mailing address to parkcitynick@gmail.com Thanks! Hey, there! These mountains are located in Jackson, WY. 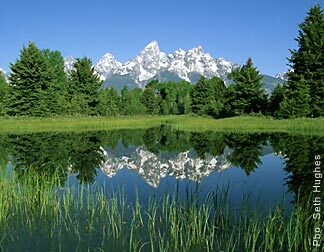 The mountain range is the Tetons and the tallest peak in the range is Grand Teton.